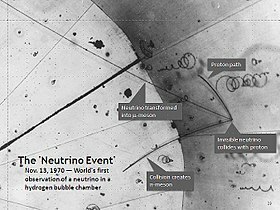 The first use of a hydrogen bubble chamber to detect neutrinos, on 13 November 1970, at Argonne National Laboratory. A neutrino hits a proton in a hydrogen atom. The collision occurs at the point where three tracks emanate on the right of the photograph. نوترینو (اینگیلیسجه: Neutrino) ، فیزیک ده اتوم ایچینده بیر ذره دیر.نوترینو فرمیونلاردان ساییلیر. ↑ (2016) «Direct Neutrino Mass Experiments». Journal of Physics: Conference Series 718: 022013. DOI:10.1088/1742-6596/718/2/022013. بۇ صفحه‌‌ سوْن دفعه ‏۲۹ مئی ۲۰۱۸، ‏۱۰:۴۸ تاریخینده دَییشدیریلمیشدیر.